Reviews from R'lyeh: Is Cthulhu ISO 9001 Compliant? Is Cthulhu ISO 9001 Compliant? Imagine if the end of the world was nigh and the only thing standing between the population of the United Kingdom and unspeakable demonic entities from dimensions beyond feasting upon its collective brains, was a top, top secret organisation leftover from World War II whose field operatives know how to combat these horrors using computational sorcery developed by Alan Turing run through iPhones, but which have to bring every mission in under budget, survive interdepartmental turf squabbles, and conduct regular paperclip audits. 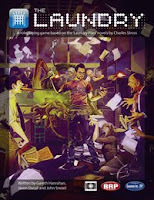 This is the set up for the “Laundry Files” – The Atrocity Archives, Jennifer Morgue, and most recently, The Fuller Memorandum – a series of novels by Charles Stross that combine Lovecraftian horror with classic espionage shot through with a heavy dose of pop culture geekery, especially computer based, and a wry sense of humour. Think Tinker, Tailor, Soldier, Spy meets Yes, Minister and Dilbert, and then send them off to deal with the Mythos, and you have about the right tone. Those then are the novels, but Cubicle Seven Entertainment happens to have published a roleplaying game based on them, and the thing is, it is a bit odd. 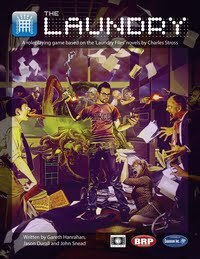 For starters, The Laundry – A roleplaying game based on the “Laundry Files” novels by Charles Stross, is actually a roleplaying game within the setting of the novels themselves. There are notes in the game that have the main character from the novels – Bob Howard – being instructed to field test the RPG (on expenses) to determine how much accurate information it contains and whether it represents a threat to the national security of the United Kingdom. Next, H.P. Lovecraft both existed in the “Laundry Files” setting and also happened to write a series of short stories about an alien god he named Cthulhu as well as various other unholy deities and entities, which have not only entered pop culture, but also happen to be almost not quite right. So it is entirely possible that the classic roleplaying game from Chaosium, Inc. also happens to exist in the setting of the novels. Which when you consider the fact that (a), The Laundry uses the Basic Roleplay system that has the same common ancestor as the mechanics in Call of Cthulhu, but is slightly more complex; and that (b), The Laundry borrows extensively from Call of Cthulhu canon (Brotherhood of the Black Pharaoh, anyone?) and its source, then the authors of this game either know too much, or they are just having a metafictional joke or two at your expense. Character generation in The Laundry is a matter of rolling dice for characteristics and then choosing a series of skill packages. These account for a character’s Personality Type, Profession, and Assignment within the Laundry as well as the skills learned on the Field Training Course. They provide for a lot of skills, many of which have to be assigned a speciality, which means that they can be taken again and again. Whilst the process neatly defines a character’s background and role within the Laundry, what it does not allow for is any kind of personal interest skills as would be found during investigator creation during Call of Cthulhu as there is no room for customisation outside of the packages. So characters cannot begin the game being an excellent swimmer or an amateur painter. Our sample character is private psychotherapist who was inducted into the Laundry after a patient exposed his occult practices during some therapy sessions. Doctor Garkovich’s move in to Field Duty after it was decided that after action monitoring was insufficient following a stress monitoring and counselling seminar. Of the skills, only Cthulhu Mythos and Sorcery cannot be improved through experience. Just as in Call of Cthulhu, the Cthulhu Mythos skill can only be increased by going insane or from researching dark tomes. Similarly, Sorcery, the practice of conducting summonings, and creating wards, bindings, and other enchantments, can only be gained through study and training. Mechanically, The Laundry uses the Basic Roleplay system and differs only slightly from Call of Cthulhu. It is still a percentile system, a success being made whenever the player successfully rolls under the skill, which can be doubled for easy tasks, and halved for difficult ones. Skills can be over 100% and this allows for exceptional successes and a decreased chance of fumbling. Overall, the rules for combat and insanity are in keeping with Call of Cthulhu. The setting of The Laundry is explored over the course of several chapters that cover everything from its history and labyrinthine organisation to the gear that its officers might be able to requisition (such as one of Erich Zann’s violin designs – unlikely, the trusty old Hand of Glory – more likely, and Personal Wards – Classes One or Two, very likely) and potential allies and adversaries at home and abroad. Particular attention is paid to budgets, requisitions, and training, with the characters being given an allowance for each mission which they can attempt to spend as they see fit (possibly helped along by their Bureaucracy and Status skills) and can best explain in after action reports. Assuming of course that the various departments that the characters report can agree as to whose departmental budget is funding the mission, complicated of course, by the fact that the characters usually report to several departments. That said, if the field agents over spend and fail to get permission for it afterwards, they will be in quite a bit of trouble with Financial Control or even the Auditors. Conversely, if they underspend, the characters can spend anything left over on weekend junkets or proper training courses, the latter leading to potential skill increases. Sorcery receives similar treatment in what is The Laundry’s densest chapter, which is not helped by a lack of example castings. The concept behind magic in the game is that it requires nothing more than enough thaumic energy and a means of computation. In the past, all that was available was the human mind and either a large sacrifice or a large cult, and sometimes both. Some cultists today still prefer this method, but with the advent of computers, Alan Turing discovered that machines could do magic a whole lot faster and with the right wards, a whole lot safer too. It is the way that the Laundry works magic today, classifying computational sorcery into five grades of summonings, glamours, geases, gates, exorcisms, and bindings. This is a very functional, almost bureaucratic magic system, as befitting the source, completely without any flash, unless that is, something goes wrong. When this happens, the most likely result is an explosive backlash of thaumic energy, but at worst, one of the sorcerers might be possessed by something from beyond or even a gate might be opened to another dimension. Such events are more likely if the casters have resorted to ritual or mental sorcery rather than computational magic. In comparison with Call of Cthulhu, there are fewer Mythos entities described in The Laundry. Of course those from the novels and stories are included, as are others, but anyone expecting a bulging bestiary will be disappointed. Not unsurprisingly, they are organised by classification; so for example, a Fire Vampire is a Level Two Entity, while Umr at’Tawil is a Level Four Entity. Level Five Entities are akin to gods and weak gods at that, so go un-described. Other threats are also detailed, mostly human in origin and this in addition to the discussion of CASE NIGHTMARE GREEN. Interspersed throughout The Laundry are a series of in-game documents that nicely provide a sense of verisimilitude. They include an introductory letter to Capital Laundry Services – the Laundry’s public face and Security: Best Practice Guide, whilst others accompany the game details on the various non-human species that the Laundry has had dealings with, and has even signed treaties with. They delightfully bland, yet helpful, and make you wish that The Laundry had come as a boxed set so that they could have been provided separately. Whilst the GM gets the bulk of the advice and the support, the player is not ignored and is given a whole chapter to himself entitled, “Expectations of Play.” Its advice is excellent, as is that for the referee, who gets to read “Expectations of Game Mastering.” This covers everything from different campaign types and style and tone to handling player input and random generating Laundry missions as to what to emphasis in the game, including the horror, the geekery, the technothriller, the occult, and espionage’s actual history. Write-ups are provided for the major characters from the novels along with new characters that can be used as player characters or NPCs. Three ready-to-play scenarios round out the book and can be used to introduce players to the setting and its various aspects. Physically, The Laundry RPG is a decent looking if plain book. Its art work is decent, but sparse, and although it looks plain, the layout is used intelligently such that it is never unreadable. It needs an edit here or there, and it does feel as if some of the sections appear much later in the book than they should. For example, the Security: Best Practice Guide and the Expectations of Play feel as if they should have been placed further towards the front of the book. In addition, it would have been nice if there more examples, particularly in the sorcery and the character generation sections. The Laundry RPG comes with just everything a GM needs to get a game going. Devotees of the “Laundry Files” will appreciate how close it feels to the novels and the advice that it gives to help the GM get close to that feel, though this is probably slightly too complex an RPG for anyone who has not played or run an RPG before. Its tone is also slightly different to any other horror RPGs, there being a deep vein of dark humour that runs through it, one not always easy to maintain alongside the horror and espionage elements. Similarly, it is very different to Call of Cthulhu. It is more constrained and its play more focused than the freewheeling style of Call of Cthulhu, primarily because the player characters are working for someone. The differences are not so much that a GM could not plunder from Call of Cthulhu and its supplements, but he needs to take care in what he imports into his Laundry game, lest it turn into a “monster of the week” campaign. If you happen to be a fan of Charles Stross’ “Laundry Files” who games, then The Laundry is going to be near perfect for you. If you are a fan of Lovecraftian investigative horror, then The Laundry presents another approach to the genre, one that is more focused, much drier in feel, and with a very much drier wit. Lastly, this is the only RPG of Lovecraftian investigative horror that bothers to discuss a pension plan, so you know The Laundry makes sense. Thanks for this review. I've been toying with getting this, and you've helped me closer to making a decision. Another bit of metafictional gubbins is that Stross started out writing for rpgs; his monsters appeared in White Dwarf, and he invented a bunch of AD&D monsters, such as the githyanki and slaad. And he does indeed talk about Delta Green in The Atrocity Archives as well. Thanks for feedback and I hope that you like the game. I will have a review of the scenario anthology up in the next few days. Would You Appley Play This? Nazi Hunting. Back for tea!